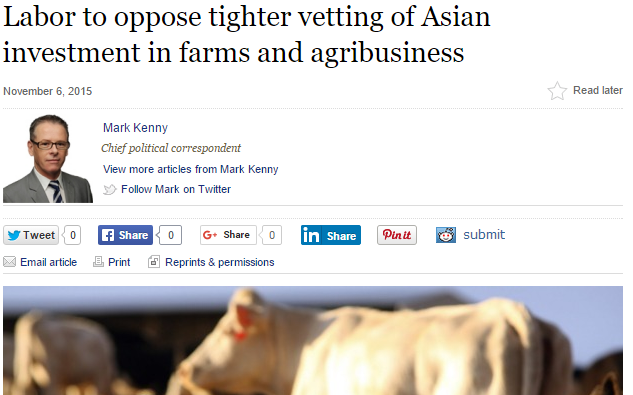 According to a report in the Canberra Times by the talented Mr Mark Kenny , the ALP intend to try to outflank Mr Robb from the economic neo-liberal ideological fringes with an even more permissive policy on unproductive foreign capital inflows spiced up with a bizarre “PC” politically correct “Say No – to Xenophobia” rationale. Yet another brainiac “political wedgie” attempt that will simply confirm in the minds of voters that the ALP remains lost in the social democratic policy wilderness. Unproductive capital inflows are damaging whether or not they come from Germany, Europe, the UK, the USA or the local region as a result of FTA agreements signed by Mr Robb. The race card is being played hard by the “sell off Australia” supporters to deflect genuine discussion of policies that are not in the national interest. If the ALP wish to burnish their economic credentials they should spend less time with the broken theories of neo-liberalism and more time studying up on regulating unproductive capital inflows and planning the reform of our monetary system and the charter and role of the RBA and APRA. According to Mr Kenny, Senator Penny Wong has been instructed to lead the charge next week and demand that the government make it even easier for unproductive and predatory foreign capital to acquire our agricultural land, claims on our future income and other productive assets. One can only assume that Senator Wong has been selected for this kooky mission, due to a non-existent or limited understanding within the current ranks of the ALP of the significance of the use of unproductive capital flows by our mercantilist trading rivals (the ones that Mr Robb has signed plenty of FTA agreements with recently) to maintain a competitive advantage over Australian workers and industry. Senator Wong, if discrimination between different sources of unproductive capital is a concern for you (and it clearly is not and just an exercise in wedge politics) then the solution is to call for the restrictions on foreign capital inflows to be tightened for ALL past agreements. It takes only an elemental understanding of economics, capital flows and Australia’s history of selling off its most productive assets to foreign ownership to appreciate why such clueless policies may have a home in a Liberal National Party government obsessed by economic neo-liberalism purity but they have no place in a social democratic party like that which the ALP still claims to be. Especially when around the world people are fast waking up (click link) to the distinction between liberalizing the movement of goods, people and services and liberalizing the flow of unproductive and often predatory capital. Recently, the Glass Pyramid provided the new leader of the Greens, Mr Richard Di Natale, with an unsolicited economic agenda fit for a centrist social democratic party. The relevance of that economic agenda to the ALP and also to the few remaining sensible members of the government was noted in that paper. Senator Wong – even if you are too busy to read it, perhaps one of your minions could give it a go over a nice slice of carrot cake during the week. Or perhaps pass it to Mr Dastiyari who at least seems to have an interest in the defects of radical neo-liberalism. The Glass Pyramid also provided Mr Scott Morrison (PM in waiting) a plan by which he could save Australia. Until the Glass Pyramid finds time to put a personalised plan together for Mr Bowen/Mr Shorten, you will have to make do with these and extracts those bits you think are most suited to whatever the ALP still thinks is important. Some other recent Glass Pyramid exclusives that might help the ALP get up to speed on why deregulated international capital flows are the key reason the ALP base in manufacturing and other industries and within the working and middle classes has been decimated over the last 30 years. When will the ALP start to understand they will always be a “poor alternative” to the LNP whilst they continue to think that shafting workers and the lower middle classes with neo-liberal fantasies and myths about unregulated international capital flows is the path back to government? That is a dud deal and a dud call to action. Low inflation (aka looming deflation) – The new excuse for even more juicy RBA bait rates.